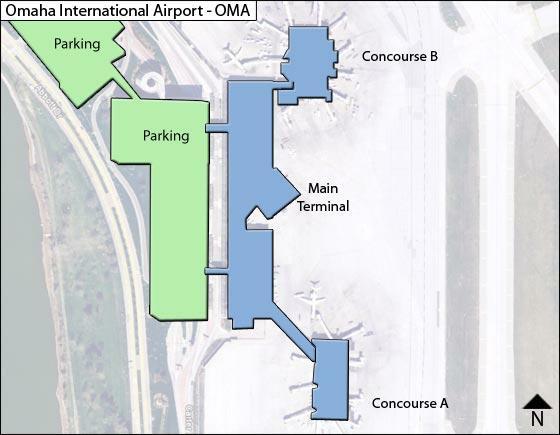 The passenger terminal complex at Omaha Eppley Airfield consists a single building, divided at both upper & lower levels by a Central Terminal, with the North Terminal to the left and the South Terminal to the right. North & South Terminals have their own baggage belts & ticket counters, while the Central terminal houses the rental car counters, an ATM machine, the Eppley Conference Center & a Ground Transportation Center. Elevator /Escalator takes you to the upper level. From the upper level, the Skywalks take you separately from South & North Terminals to the parking garage. Food & drink are available at main terminal & concourses. Conference rooms are available in the upper level of the north terminal. For more information contact Rigel Airport Svcs. at 402-422-6376. The lower level is the baggage claim level with entry doors 1 & 2 for South Terminal, door 3 for Central Terminal and doors 4 & 5 for North Terminal. It houses in the arrivals hall rental car counters, Lost & Found, First Aid, food/drink, ATM, and with outside ground transportation and access to Surface Parking Lot. Concourse A on the south side with gates A1 to A10 is currently served by Alaska, Allegiant, American, Delta Frontier & Delta airlines. Concourse B on the north side with gates A11 to A20 is currently served by Southwest, & United airlines. Allegiant: R & B: 702-505-8888; TCH: opens 90 mins prior to first & closes after last departure. American: R: 800-433-7300; B: 800-535-5225 or 402-422-0152; TCH: 4am-7:30pm. Delta: R: 800-221-1212; B: 402-344-5494 or 800-221-1212; TCH: 4:30am-7:30pm. Frontier: R: 800-432-1359; B: 800-432-1359 or 402-422-6483; TCH: 4:30am-7pm. United: R: 800-864-8331; B: 800-221-6903 or 402-422-6282; TCH: 5am-6:45pm.